Let me start by saying when I first put my hands on this piece I was blown away. Just the fact that I obtained an actual antique example was quite surprising because from my experience as a collector and researcher this particular type of weapon is rare to the point of almost non-existence. We may still see practice routines alive today in Chinese martial art systems like Hung Gar but old short chain whip examples like this are terribly scarce. With that said the weapon presented here is both fascinating and important for many reasons we will explore. A few words are in order about the feel of this weapon in hand and some observations on its construction. My first thoughts when handling this piece was it felt quite compact and weighty. Unlike many longer antique whip chains I have owned this one gives an impression of more control-ability and options to use it in closer quarters due to the shorter length. It’s also heavy enough to feel menacing and a bit medieval. You would not want to be hit by this tool. The actual sections are definitely notable too. One might think it is the smaller number of sections and shorter length of the weapon overall that makes this one unique and “Southern Chinese.” From my experience that may not necessarily be true. I have seen other antique examples that were collected from Northern areas of China that look very much like standard and longer Northern seven, eight, nine section whips except they are short and may only have three or four sections. Please look for the link at the bottom of this page; it will guide you to additional photo examples to see for yourself. I have said it before and will say it again; I believe that variation is the rule rather than the exception when understanding real antique Chinese martial art weapons. What is unique to me about this particular whip is how huge the actual sections are. They are really long and quite thick compared to other examples. The percussive end of all chain whips are generally long and robust, but it’s unusual to see the end be so comparable in thickness and weight to the sections as you see on this piece. The sharp point at the percussive end is pretty unusual too. Generally they are rounded by design or use. This example is pointy and sharp. Here are a few more interesting details worth mentioning. You can see the forge welded rings which are essentially heated up and hammered into shape to create an unbroken circle. In the photos you can see variability in the thickness of the rings that is either from how it was constructed by the blacksmith or from wear patterns due to heavy use, maybe both. How the grip was wrapped is also worth discussing. I have seen this kind of base layer of paper wrapping on numerous other old Chinese weapons like swords and mace. It seems like a fast and easy way to thicken up the grip surface. Who knows, maybe there was also some kind of glue involved originally to help keep the grip material stable when it cured. This example is wrapped really tight too; there is no spinning it around. The entire handle section generally speaking is very solidly constructed with zero moving parts. The cotton cord wrap here is similar to quite a few other antique weapons I have owned as well. This one also has a cotton strip of fabric woven into every few rounds of cord that would have went up the length of the grip area when it was complete in the past. This type of treatment may have offered extra grip potential or maybe it was just for decoration. Every time I have the opportunity to own a new piece like this I try to learn about its past and recent history. So often there is precious little if any good information that accompanies them. Sometimes they even come with standard stories you hear quite often like “this is from the Boxer Rebellion.” I have heard that one so many times you would think it was the only conflict that ever occurred in China. Basically it is an easy and intuitively sensible answer that satisfies most people, unfortunately this quick fix approach to understanding these weapons also stops further thought and investigation. Although the weapons themselves are quite interesting, the object alone is only half the story. The other half lay in the lives of the people and real life context in which they were used. Who would own such a weapon and why? Those are hard questions to tease out. Let’s explore some ideas. I have read that in the decades following the mid nineteenth century industry, population, and urbanization grew rapidly in Southern China particularly in the bigger cities. This changing and more monetized society created a market for the first public martial art schools akin to what we see today. The Hung Sing Association that taught the Choy Lay Fut style kung fu was one of the prime examples with many branches open to the public for a fee (Judkins, Ben. Nielson, Jon. The Creation of Wing Chun : a social history of southern Chinese martial arts. Albany: StateUniversity of New York Press, 2015. Print). Bearing that model in mind it’s meaningful that even today we still see three section whip practice routines in Chinese martial art styles that trace their origins to South China like Hung Gar. It’s not hard to imagine that these old kung fu schools are a place where a person may have been introduced to such a weapon. That interpretation may also be trying to manufacture a convenient explanation that would fit in with our modern martial art understanding. I think another probable truth worth considering is we do not really know for sure what this seemingly esoteric weapons place was in nineteenth century society. Were they rare or somewhat common as far as weapons go? Was it particular to a specific area? Was it exclusive to martial art specialists or seen in everyday life too? We have looked at the forked mace a.k.a Chinese sai in another of my blog post which is also still practiced in Southern Chinese martial art systems today, but historical photos have shown us that police and or prison officials clearly used them too. Could this be the same type of situation? Maybe police used them to bind or intimidate. The same could be said for an organized crime member in the process of extorting merchants. Anyone holding this weapon with intent would be pretty scary. Could it be a backup weapon for a security guard accompanying a government shipment of silver in transit? For me these items often create as many new questions as answering old ones. It’s fascinating to consider though. I think for many like myself involved in the modern martial art world it is important to keep an open mind about such things and not live under the illusion that we have it all figured out. 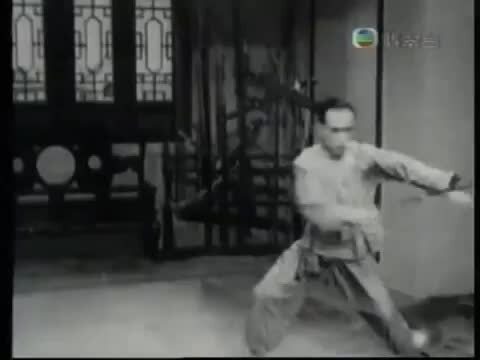 Excerpt from an early Wong Fei Hung movie featuring a Hung Gar style short chain whip practice routine performed by Lau Cheung Yan Sifu who was a student of Master Lam Sai Wing. As I said before these weapons often come with little information and you have to dig and postulate for the rest. I won’t insult you by saying this weapon is from the Boxer Rebellion, its actually from a garage sale (-: The truth is I purchased it from a young man whose family lives in a town not too terribly far from Los Angeles California. His grandparents had recently passed away and he was helping put their estate in order and gathering things for a garage sale. One of the more interesting items that turned up was this three section whip. I think the location where it was found could be quite significant and really add some human depth to the story of this object. As many of us know California had a major influx of Chinese immigration in the mid nineteenth century and its following decades. Tens and tens of thousands of mainly Southern Chinese men predominantly from Guangdong province came to California to work in the gold fields and other mining, agriculture, railroad building and more. It is my understanding that most were not looking to make America their home but rather planned to earn wages and return to China. In addition to making a living in hard labor these immigrants were subject to significant racism by the Euro-American people of California. The Chinese Exclusion Act of 1882 is clear proof of that. Due to specifically targeted ethnic and national resentment against these Chinese immigrants this eventual Federal law made it illegal for Chinese to enter the U.S. These conditions essentially lasted from 1882 to 1943. With all that said I think it is quite possible that this steel chain whip was brought overseas to California with a Southern Chinese Immigrant in the time period we just discussed (1850-1880). As you can see in the photo near the top of the page the forged manner in which it was constructed is very similar to the longer northern made sectional whip that also dates to the mid to later nineteenth century. That observation in combination with where it was found, and the historic immigration laws helped me estimate the date of this piece. Although I cannot say for sure this item may be a very early relic of Chinese American Martial art history. Collecting these weapons has been a great spring board to motivate me to investigate their past and try and understand the people who may have actually used them. Through that process I have learned a lot about real life Chinese martial art history. Sadly there is often as much misinformation and even fantasy floating around in the kung fu world as credible history. Myth and legend definitely have their place but there is so many fascinating true life stories available today if one just takes the time and interest to look for it. It’s also enlightening how knowledge of the past can inform our present. I think the picture above is a great example. You can identify the two nineteenth century chain whips in the photo by their dark patina. They are obviously serious weapons. The one below these is commonly seen on the market today and sold as the “traditional” option to kung fu practitioners. The piece below it is offered as “wushu” weight and used in the performance driven martial athletics sport. The basic design has mostly stayed the same over time but clearly they are getting lighter and lighter. The same trend is seen across the board in most of today’s kung fu training weapons. It appears that because our modern society does not use them as real weapons anymore they are changing and moving more toward ease of use with performance and safety enhancing weights and designs. It also seems to me that what we are often calling “traditional” weapons in kung fu today fall quite short when actually held next to an original fighting example. Of course not everyone cares or wants to be historically accurate with their practice weapons, and that is their choice. For me though I stand behind the belief that exposure and pursuit of historical knowledge guides us, and is a much firmer foundation to build our understanding and practice of Chinese martial arts in the present. These antique examples offer a glimpse into historical truths and can act as solid benchmarks that we can always return to for guidance despite other trends that rise over time. In addition to physically training and studying antique weapons I enjoy reading other researchers works on Chinese martial arts history in various topics. One great book that I think is particularly relevant to the short whip and its history presented here is Ben Judkins and Jon Nielsons The Creation of Wing Chun – a social history of Southern Chinese martial arts. You may be thinking they do not practice whip chain in Wing Chun style. You are correct, but in this case it’s the second half of the title that is important to the larger audience. The authors essentially spend the first half of the book presenting a broad and very informative view of Southern Chinese martial art history. I will let the first three chapter titles entice you to investigate it for yourself. Chapter one - Growth and disorder: paradoxes of the Qing dynasty. Chapter two –Setting the stage: The evolution of Guangdong’s martial arts 1800-1911. Chapter three – Northern tigers vs. Southern Heroes: local identity, national reform and the golden age of Guangdong’s martial arts, 1911-1949. It’s honestly so much information it has to be read several times. The chapter notes on their source material are really interesting too. I also appreciate these authors using some academic standards for their work that you do not often see in martial art publications. For today’s Chinese martial artist enthusiast this is a great opportunity to learn more about the history of so many styles that are discussed like Wing Chin, Hung Gar, Bak Mei, Southern Mantis, Northern Shaolin, Taiji and the list goes on and on.